Fall is around the corner so, this is a perfect time to give you a little scoop of what happened in Miami before we talk Fall trends. Why? Well, I for one will plan for a vacation someplace nice with a much warmer weather before we dive in into the cold season, and I hope you all do the same. So, there is no better time to discuss the Miami Swim Week and what's hot and not. 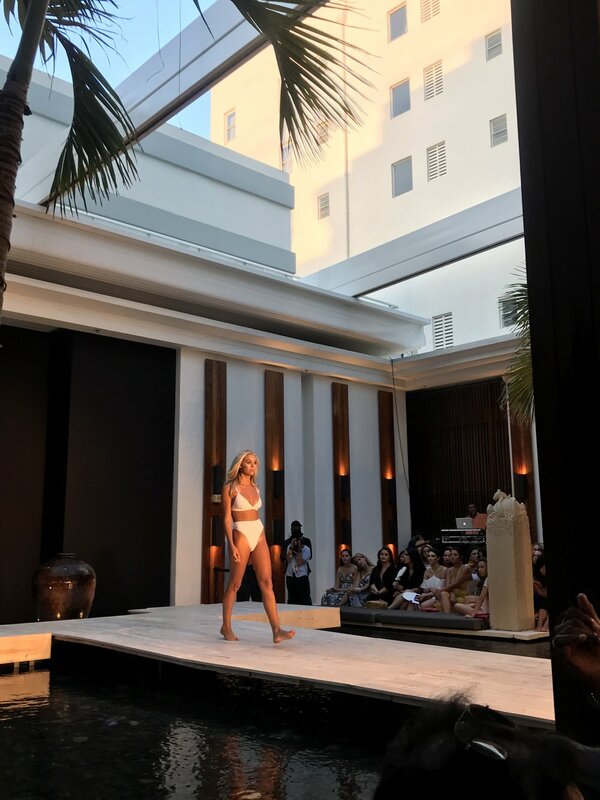 This is my first time at the Miami Swim Week and boy, it was quite an experience! I was especially lucky because this season we are experiencing a comeback of the 80s and 90s, so, stylistically, the trends were very interesting and varied. Sinesia Karol's collection debuted this season with a classic luxurious collection. Refinement was the key defining word and the entire show was captivating. 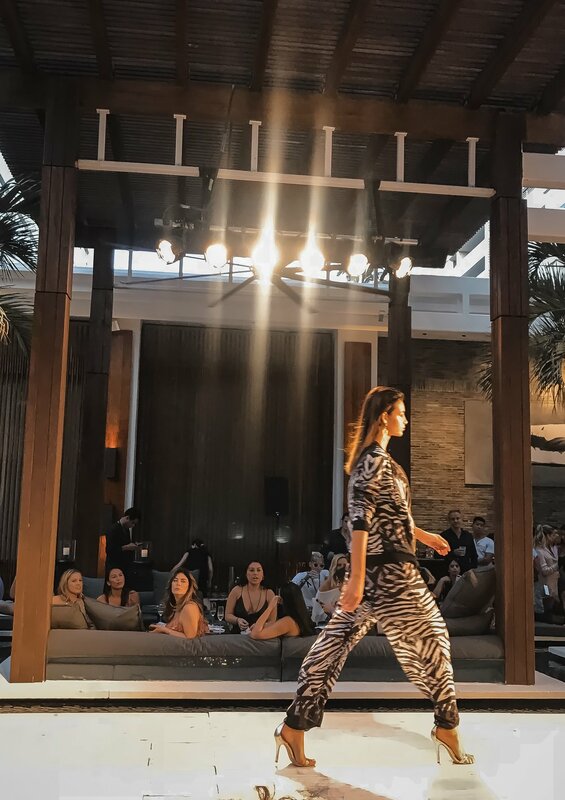 The show was very well organized and the models walked under the classic song Girl from Ipanema slowly showcasing the beautifully constructed designs. The luxurious lycras glistened in the dark and the prints on the monokinis and the two-piece bikinis were sophisticated and graceful. They were flowy and silky. The nostalgic song was matched by the models' gait that swayed to the song gracefully to match the silkiness of the fabric and the soft light. Everything flowed in perfect synergy like an artist's brush stroke. A little about the designer: Sinesia Karol comes from Brazil and currently resides in Boston, Massachusetts where she splits her time between Brazil and the US. After coming to the US, her aesthetic had to adapt to the American audience where women's lifestyle differs from those in Brazil. The designer remains true to her values: quality, femininity, sophistication, high fashion and celebration of women of all ages. It is refreshing to see that after settling in the US, she also added to her portfolio the comfort part to her designs. Another thing that I also noted was the fact that she used for her runway older models, for which I wholeheartedly applaud her. Final verdict: the collection is exquisite, classic and meant to be worn by women with with a refined sense of style, who appreciate sohistication and the quality in every sense. Simply sublime. Aqua Blu's collection evoked a strong sense of femininity, intertwined with luxurious glam. The swimwear was vibrant and reminiscent of exotic island life. The prints were colorful and exotic with lots of peakock and zebra prints. The fabrics were fluid, with a subtle shine and everything about that collection exuded quality and classic glam. Aqua Blu is an Australian label founded in 2000 that since its inception has been commended for its quality, strong sense of femininity and sensuality. All these elements were definitely abundant in this collection as well. VDM the Label's collection was very young, sporty and buoyant. The models debuted the collection on the soundtrack 'Ice Ice Baby' and wearing the ever so popular dad sneakers. The models were styled in the spirit of the 90s as well with high volume hair and displayed the 90s attitude to match the song and the decade's vibe. The only thing that reminded that they were in the present was the glow galore. The collection was sporty, young and cohesive. The brand takes pride in its quality and use of eco-friendly materials. TJ SWIM's collection was inspired by the 80s. The collection was edgy yet sophisticated, feminine and sensual. The design lines were simple and clean. 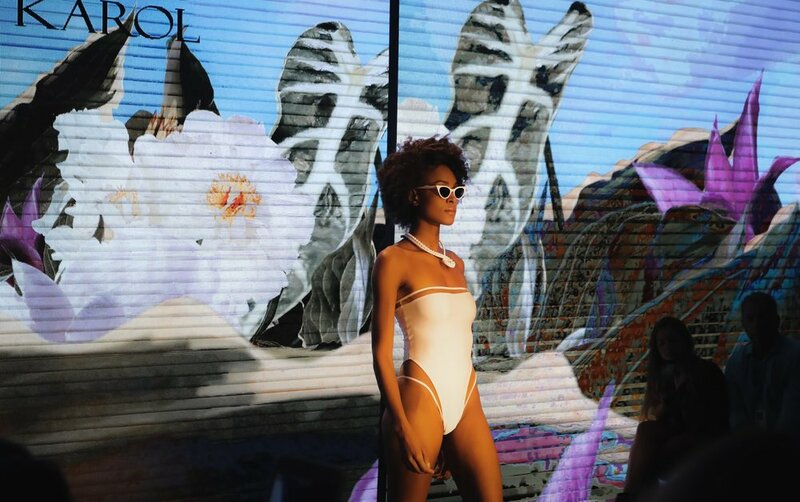 Some of the styles (white two-piece bikinis) have been layered with long sleeved black cropped tops which only added more sensuality and a little dose of mystery due to the created contrast. The inspiration and theme of the collection was "Miami Heath" which I thought was subtly and successfully conveyed through this collection. Overall, a very successful and intriguing collection. Lil x Emm's collection was feminine and sensual and enchanted us with a Moroccan theme. The pinks salvars, the sheer silks, and scarfs the models hairs all weaved subtle unforgettable moments. The models were barefoot, walking slowly. Some of the swimsuits were styled with long sleeved tops which was unexpected but interesting, and played well into the Oriental modest theme. Certainly a very unique collection composition wise. Miami is very hot and humid in summer and during July is also happens to rain a lot. The rain doesn't last long and is actually a Godsend as it freshens up a little. It comes and goes and the sun is up before you know it. So, what should you pack for beach vacation trip if you want to look chic yet stay cool during your time there? WHITE CLOTHES. They do not absorb the sun as much and they also look great on tanned skin. So, you'll get the double benefit as they will filter out the UV rays and protect your skin while also adding some chicness. Go for tanks tops, summer pants, linen if you find a good fitting one, shorts, skirts, and an open-knit cardigan like mine. I loved wearing mine over my shoulders in the evening when it was cooler with cropped tops but you can also tuck it in it a little more in the front and it will still look super chic (See how I inserted it in my first two pictures). LINEN. Linen skirts tops are amazing for warm weather as they keep you cool. The simpler the design the better because you can style them in multiple ways. See the above pictures where I am wearing shorts and crop top in linen. Mine are from Floreiza Firenze and Innika Choo. SHORT SKIRTS. Again, beach towns have a different fashion. You learn quickly to adapt and people expose more skin. Pick a flattering skirt but surely, you'll thank me later. Try to go for a color that matches the clothes in the existing color palette from the others groups so that you can mix and match them. That way you will need to pack less :-). One that I found very versatile during my stay was this one from Revolve that I absolutely adore and can't get enough of. MONOKINIS. Monokinis are great because you can wear them at the beach, pool and then you can also wear them as a top with your shorts, skirt, or linen pants later for dinner, pool party or even club if you monokini is stylish enough (like I did - see the picture where I was wearing the black shoes with the printed monokini and the studded clutch!). My monokini is reversible, is from Revel Rey and now you can buy on ASOS.